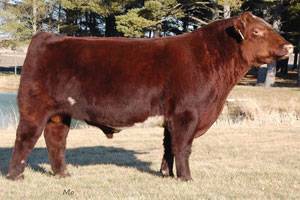 Hot Commodity is quickly becoming one of the hottest Shorthorn bulls available today. His calves are small at birth and delivered easily. They have the shape and design to satisfy the most critical. Very fluid in his movement and a tremendous foot and leg. At nearly 5 years of age, he has never had a foot lifted. And to date, I have not trimmed the feet on any of his offspring. His acceptance is growing daily. In 2011, Cates Farm leased Hot Commodity for a 60 day period. In their 2012 calf crop, they sold a $45,000 heifer calf that was a Reserve Division winner at the NAILE Natl. Shorthorn Show. Also in 2011, the first bull calf sold by Jordan Acres, JA Commotion, sold at a record price at the Illinois Beef Expo for $11,000.